It is my great honour to be awarded the 4th Marcin Antczak Award for the most inspiring ornithological paper published in 2017! I was awarded for my papers on interspecific social information use and acoustic communication in wood warblers. You can read more about these papers here and here, while here you can find the official announcement of the International Board of Marcin Antczak Award. The Marcin Antczak Award is presented annually for an outstanding and inspiring ornithological paper published in the preceding year by an early career researcher from Poland, the Czech Republic, or Slovakia. 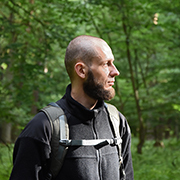 The Award commemorates Dr Marcin Antczak, who was an excellent field ornithologist working on shrikes and other bird species in Central Europe and Africa. He tragically died in car accident on his way to the field on 2nd May 2014, in his 37th year of life. This award has a very special meaning to me. I had the privilage to know Marcin personally, as during my studies at Adam Mickiewicz University I attended lectures on behavioral ecology and ethology he was co-organizing together with Michał Skierczyński, who was at that time my supervisor. These lectures, full of passion and great sense of humor, ultimately grounded my research interests and inspired to study how animals behave and why they do what they do. Later, we spent a lot of time chatting about fascinating aspects of animal behavior, until that sad 2nd May 2014… Receiving now the award that commemorates Marcin’s contribution to ornithology is a true honour! You can read more about Marcin’s scientific career here – click! ← Field season 2018 is over!